March 10: Louisiana Purchase ceremony. Year 1804 (MDCCCIV) was a leap year starting on Sunday (link will display the full calendar) of the Gregorian calendar (or a leap year starting on Friday of the 12-day slower Julian calendar). January 1 - End of French rule in Haiti. Haiti gains independence from France and becomes the first black republic, having the only successful slave revolt ever. February 15 - New Jersey becomes the last northern state to abolish slavery. February 16: USS Philadelphia burns. February 18 - Ohio University is chartered by the Ohio General Assembly. February 21 - The Cornishman Richard Trevithick's newly-built "Penydarren" steam locomotive operates on the Merthyr Tramroad between Penydarren in Merthyr Tydfil and Abercynon in South Wales, following several trials since February 13, the world's first locomotive to work on rails. March 7 - John Wedgwood founds The Royal Horticultural Society. March 10 - Louisiana Purchase: In St. Louis, Missouri, a formal ceremony is conducted to transfer ownership of Louisiana Territory from France to the United States. March 20 - Execution of the Duc d’Enghien for plotting against Napoleon. March 21 - Code Napoleon adopted as French civil law. April 2 - Forty merchantmen are wrecked when a convoy led by HMS Apollo runs aground off Portugal. April 5 - The first recorded meteorite falls in Possil, Scotland (High Possil Meteorite). April 26 - Henry Addington resigns as Prime Minister of the United Kingdom. May 10 - William Pitt the younger begins his second term as a Prime Minister of the United Kingdom. May 18 - Napoleon Bonaparte is proclaimed Emperor of the French by the French Senate. June 15 - The Twelfth Amendment to the U.S. Constitution ratified by New Hampshire, and arguably becomes effective (subsequently vetoed by the Governor of New Hampshire). July 11: Burr shot Alexander Hamilton. 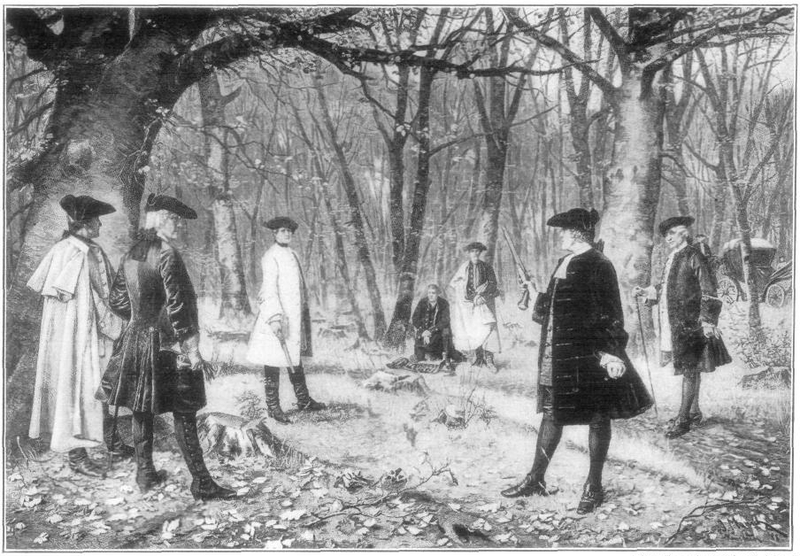 July 11 - Alexander Hamilton was shot during a duel with Aaron Burr and dies the next day. August 20 - Lewis and Clark Expedition: The "Corps of Discovery", whose purpose is to explore the Louisiana Purchase, suffers its only death when Sergeant Charles Floyd dies, apparently from acute appendicitis. Thomas Jefferson defeats Charles C. Pinckney in U.S. presidential election. November 30 - The Democratic-Republican-controlled United States Senate begin an impeachment trial against Federalist-partisan Supreme Court of the United States Justice Samuel Chase (he was charged with political bias but was acquitted by the Senate of all charges on March 1, 1805). December 2 - At Notre Dame Cathedral in Paris, Napoleon Bonaparte crowns himself as the first Emperor of the French in a thousand years (the Napoleonic Code is adopted). December 12 - Spain declares war on Britain. [[Image:Pere Lachaise looking down the hill.jpg |thumb|230px|right| Père Lachaise cemetery}}. Père Lachaise Cemetery a 118 acre (0.5 km²) cemetery in Paris, France is founded. Morphine is first isolated from opium by the German pharmacist, Friedrich Sertürner. World population reached 1 billion people. Matthew Flinders recommends that New Holland, be renamed "Australia" (from the Latin "australis" meaning "of the south"). See also Category:Born in 1804. 84 people were married in 1804. There were 0 military battles in 1804. This page uses content from the English language Wikipedia. The original content was at 1804. The list of authors can be seen in the page history. As with this Familypedia wiki, the content of Wikipedia is available under the Creative Commons License.